LOCATION This beautifully presented apartment is situated in the new Kilnwood Vale development, offering easy access to both Horsham and Crawley whilst also boasting immediate access to the A264 for Gatwick and M23/M25 to London. Just over 5 miles from this stunning property is Horsham town, which offers a comprehensive range of shopping, sporting and leisure facilities including The Capitol Theatre and Horsham Park. Also within easy reach is Crawley town centre with its extensive shopping facilities, range of restaurants and varied leisure facilities. Both Horsham and Crawley offer fast and frequent services into London Victoria, London Bridge, Gatwick Airport and the south coast. In addition, there are a number of local amenities including Cottesmore Golf & Country Club with two highly regarded Golf Courses plus other sports facilities, Cottesmore Prep School and the Holmbush Inn. PROPERTY From the modern Communal Entrance Hall, with video entry system, stairs lead you to the First Floor, where you will find the front door to this modern property. Once inside the flat, you find yourself in the Hall, which has a large cupboard and doors to all rooms including the impressive, double aspect, open plan Living/Kitchen Area, which boasts maximum measurements of 20’2 x 17’10, and has double doors opening to your private Balcony. The generous Kitchen area has a range of floor and wall mounted units, large areas of worktop and integrated Bosch appliances. This stylish apartment has a modern Family Bathroom, and two Double Bedrooms, with the Master benefitting from being double aspect, measuring 17ft in length, having built in Wardrobes and an En Suite Shower Room. 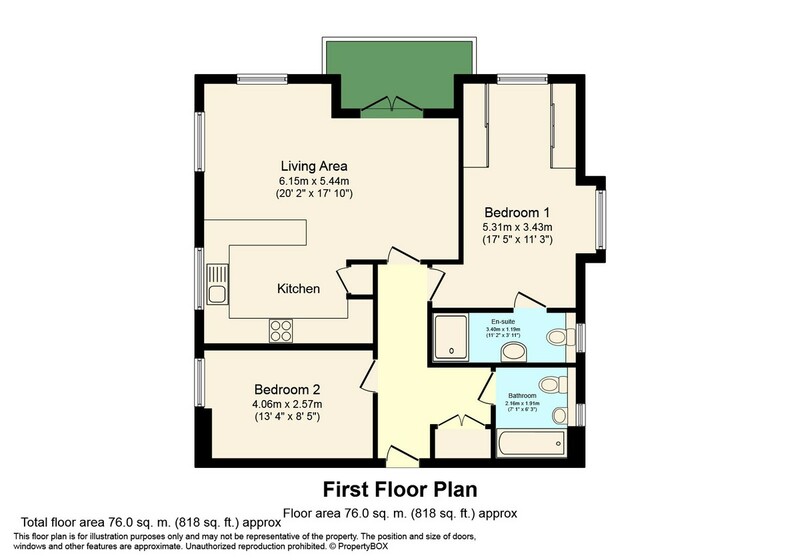 OUTSIDE This impressive Apartment comes with an allocated, off street parking space, with plenty of additional spaces for visitors and the remainder of the 10 year NHBC warranty. The property is surrounded by well kept grounds, which are well maintained and offers the ideal outlook from your private balcony and windows in the Living Room.